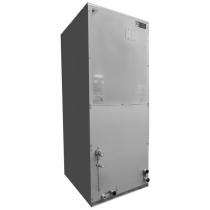 The Daikin Inverter Ducted Heat Pump is a cost effective alternative to traditional gas furnace/AC systems. Daikin Inverter Ducted systems provide 100% heating capacity when the outside temperature is as low as 14°F (systems can operate in heating mode down to 0°F), making them cheaper to run than traditional heat-pump systems in most climates. Inverter Ducted Air Handling Unit FTQ_PBVJU There are 5 products.